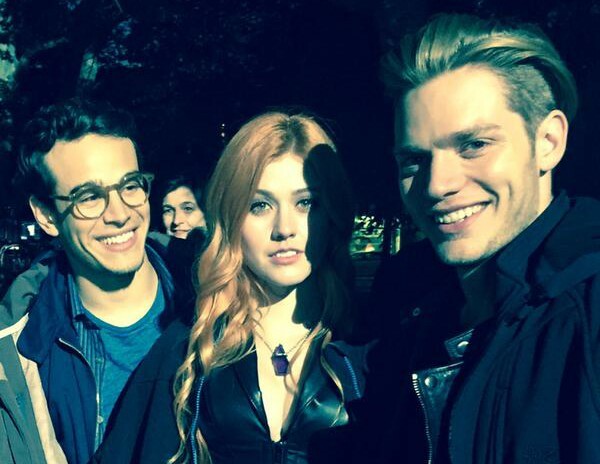 Filming has almost wrapped on the pilot of Shadowhunters, which entered its 10th day (of 12) of shooting on Friday. Executive producer McG, who also is directing the first episode, shared a photo from dailies of what we can assume was a scene that was filmed on Friday. It’s a scene that fans of the books will remember well. McG — and Katherine McNamara — even used the exact line of dialogue from the book. Showrunner Ed Decter shared some photos of Alberto Rosende near what appears to be Simon’s band’s van and Alberto, Kat and Dom. Also, this photo of McNamara, Dominic Sherwood, Rosende and Isaiah Mustafa looking HOT was released. Ed later tweeted a photo of our Alec, Matthew Daddario, with a photobombing McG. Katherine McNamara took to her twitter to share a cute photo of Clary and Jocelyn. Early Saturday morning McG shared a photo of Simon, Clary and Jace, and a photo of the band’s van in front of the Institute. Shadowhunters will film through October in Toronto and will premiere in early 2016 on ABC Family. Simon’s band van looks awesome and that scene photo looks so dark and gritty! Can’t wait! By the Angel the entire cast is VERY hot, but where’s Matt!?!? @zoe, our matt is the one holding a mac laptop (the taller one) squeeks… oh god, he really is g.o.r.g.e.o.u.s.!!! Runes runes! Black runes! They’re black! All is well. Ravenor demon!! (with the speaking it seems), and the band van! I guess Clary helped him pain their latest name on it and added the rune!? That’d be awesome. These are loyal details yay! Also HOT DAMN!!! ❤ Dom Sherwood, Isaiah Mustafa and Alberto Rosende! Did anyone notice that on the photo of the picture frame, there was a rune? Am I the only one? The rune is on Kat McNamara’s phone case. this show…is …going.. to be ..amazinggggggggggg ! I need to read that part of City of Bones again. The Ravener’s dialogue had fled my memory. Is dat a rune i see on alexander’s shoulder?